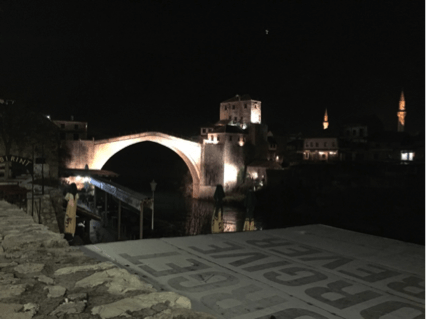 To be honest, prior to this trip, I did not know much about Bosnia and Herzegovina and its history aside from the fact it was part of the former Yugoslavia and had been battled by war. 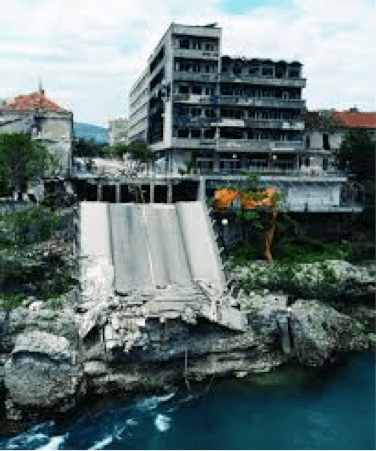 Thus, heading into our bus ride from Split, Croatia, I had no idea what to expect except from Calvin’s Balkan’s Trip in Summer 2017 and seeing his photos of the Old Bridge (Stari Most). 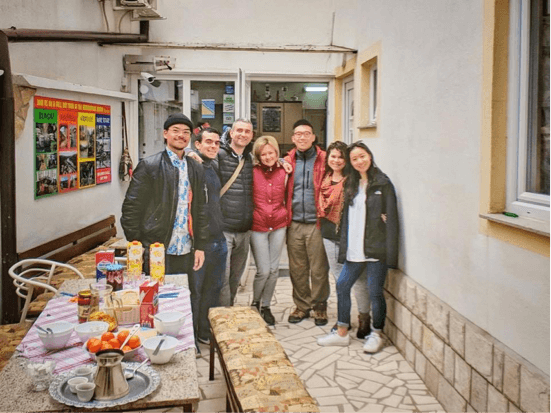 After catching a quick breakfast in NoStress Bistro, we went to the Split Bus Terminal early to catch the 10:55 AM Croatia Bus/Globtour bus to Mostar. After a 10-minute delay and 1 unexpected bus transfer, we arrived around 3:45 PM at Mostar (East) Bus Terminal. 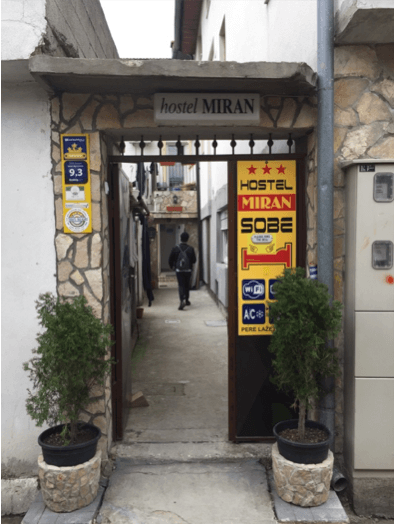 Hoping to maximize our limited time in Mostar, we quickly walked to our hostel, Hostel Miran, which was a short 6-minute walk from the station. Signage to the place were helpful, making it super easy to find the hostel. 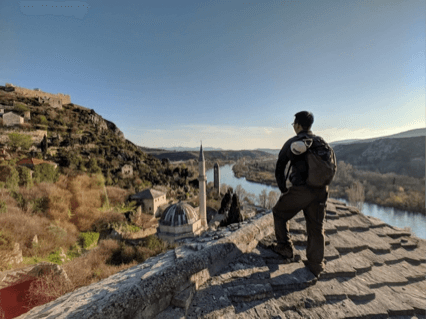 While booking for the hostel, I remembered that the host, Miran, offers a day tour visiting several sites around Mostar as well as the Old Bridge. Being that we arrived later than expected and most of the day was already gone, I thought the best we would be able to do was to visit the Old Bridge, the Old Town Bazaar and dinner. However, feeling ambitious, I decided to ask Maja (Miran’s wife) who checked us in if we could still do at least part of the tour. To our surprise, Miran said yes and for a discounted price of 25 euros per person (normally 30 euros per person from 10AM to 6PM). Miran, the owner of the hostel, is a native of Mostar who grew up during the Bosnian War of 1992-1995. 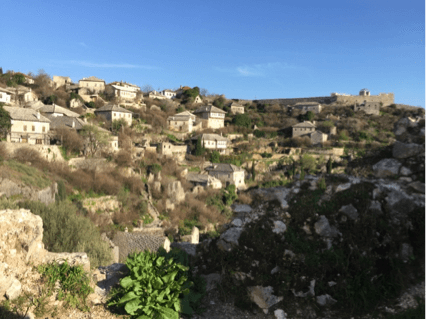 A very passionate person who is enthusiastic to teach others an important part of Bosnia and Herzegovnia’s history, Miran would go out of his way to make sure his guests were well attended to. 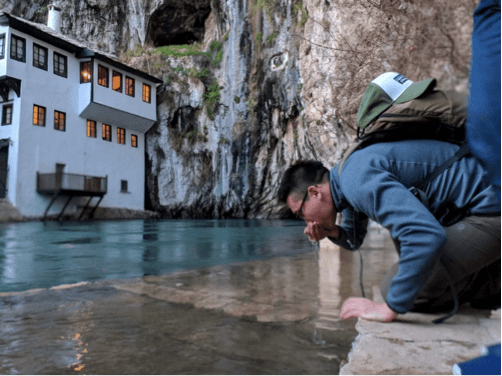 Normally his tour includes visiting Blagaj, Pocitelj, Kravice Waterfalls, Medugorje, Mount Velez and a war tour with his own personal stories. However, he is very accommodating and willing to tailor his tour to what we wanted to see as well. In the end, we decided to skip Kravice waterfall since we recently saw Plitvice Lakes NP and Krka NP in Croatia. First, we stopped by Pociteji, a preserved, fortified Bosnian town dating back to 1383 with beautiful examples of medieval and Ottoman architecture. 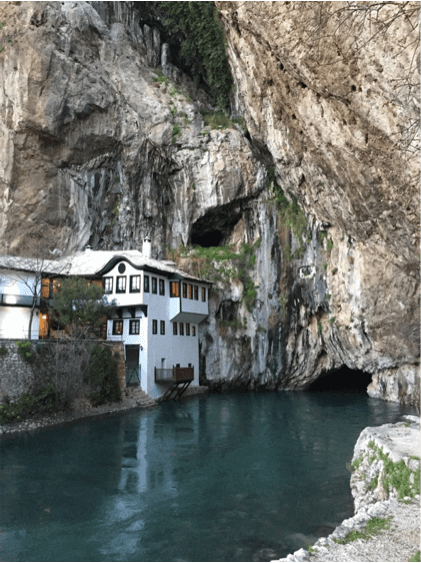 Then, we stopped by Blagaj, a historic Dervish monastery built into the cliff along the karst Buna river which flows out of the surrounding mountains. Known for being one of the strongest spring in Europe, many will stop to drink some of the water after eating some pomegranate seeds sold at a nearby local stand. Finally, we came back to pick up our friend, who couldn’t join because she injured her knee, to see the Old Bridge (Star Most) at night. 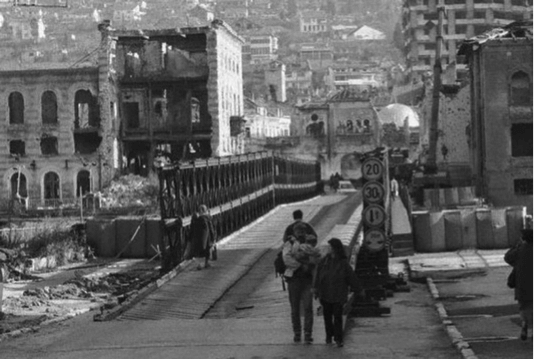 Along the way, Miran stopped by several streets in town to show the remnants of the bombings and destroyed buildings with penetrating bullet holes from the war. In addition, Miran gave his take on the war, his perspective on socialism vs capitalism and much more. It was interesting to connect what we learned in the past coming from the US and the differences seen firsthand. It was a true learning experience. 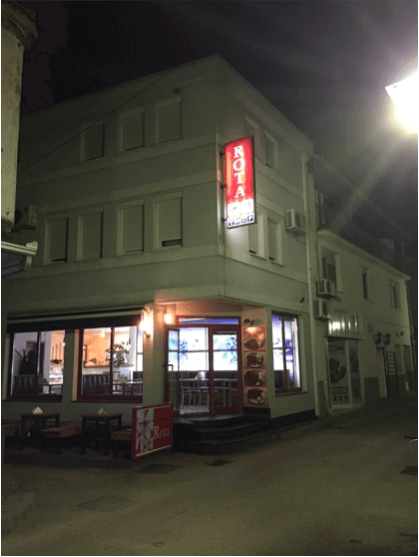 While there were many places to eat for dinner (Urban Grill was suggested by many), Miran suggested Rota Grill a cheaper and better restaurant for Cevapi and Sudzukice (home-made sausages). 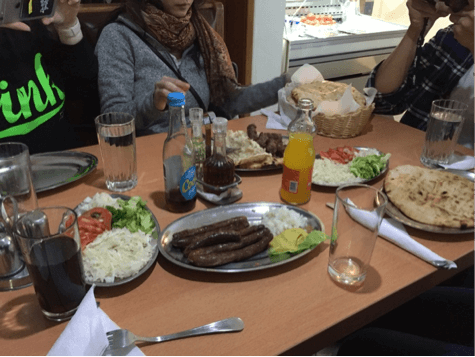 It was by far one of the best authentic meals we ate. Just while we thought we would have to end our night early to catch our 7AM bus to Dubrovnik the next day, Miran by chance told us he also offers direct transfer to our hostel in Dubrovnik. For about the same price (20 euros), it takes only 2 – 2.5 hours instead of the estimated 4 hours by bus. This is because the bus companies cross 2 borders and drive through the scenic route along the coast. 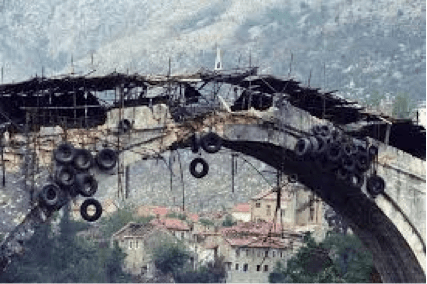 Instead, Miran’s transfer drives through Bosnia, only needing to cross one border by passing through the town, Trebinje. Plus, you get to see the country side. 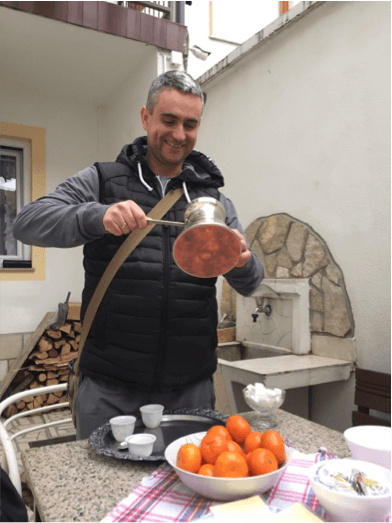 As a result, we got to sleep in and got to try some home-made jam and traditional Bosnian coffee (free breakfast) in the morning. A true legend, who knows practically everyone in town, Miran was one of the biggest reasons why as a group we fell in love with Mostar, even though we were there for less than a day. His hospitality is unlike any other and he is a great guy with a big heart. Thanks again Miran and his family for hosting us and allowing us to be part of his family for the day!